Are you ready for some football... and bass? 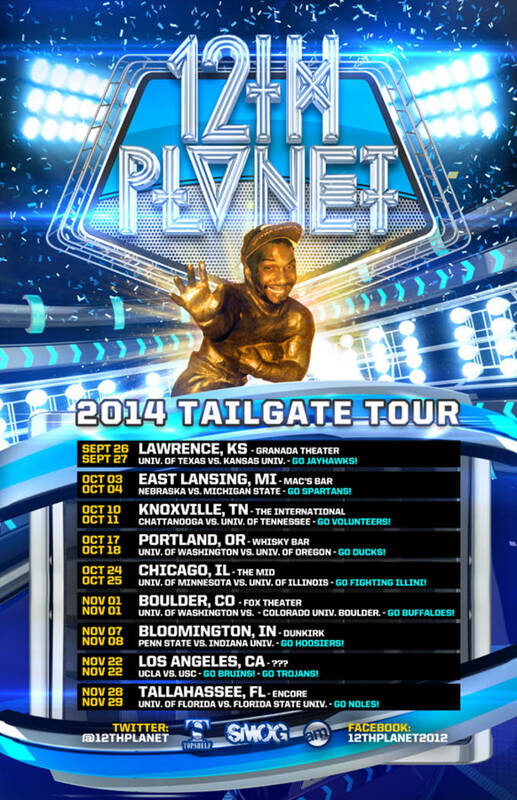 12th Planet just announced his 2014 Tailgating Tour, and its pretty amazing. Starting next weekend he&apos;ll be performing in a college town near you on a Friday night, then partying at the home team tailgate party the next day. 12th Planet says he might even do a surprise after party in the evening after the game, if his fans can handle the extended rager. The tour starts at the University of Kansas and hits Michigan State, University of Tennessee, University of Oregon, University of Illinois, Colorado University, Indiana University then unravels in Los Angeles for the UCLA vs. USC hometown rivalry game and delivers a final encore in Tallahassee for University of Florida vs. Florida State. We&apos;re a little scared for John Dadzie aka 12th Planet&apos;s well being, but we know he can handle it. Check out the official tour trailer below, and the flyer for dates that he&apos;ll be at your college campus.